Congratulations to Margaret on the purchase of Nim!! Were happy for the two of you, and excited to see you grow together! We will be on the look out for a new school horse. SaddleBack Summer Show - Sat, August 25! The SaddleBack In-Barn Summer Horse Show will be on Saturday, August 25th. The Prize-List (with show schedule) and Sign-up sheets are posted on the tack room window. Entry forms are available in the tack room. A $50 deposit & Entry Form are required when signing up to reserve your preferred school horse. Total show cost for a full division with school horse is $150 & cost with own horse is $120. This is a great opportunity for riders to get a taste of what shows are like, and for those already showing to practice moving up a division. Fall Beginner Lesson Session starting in 4 weeks! 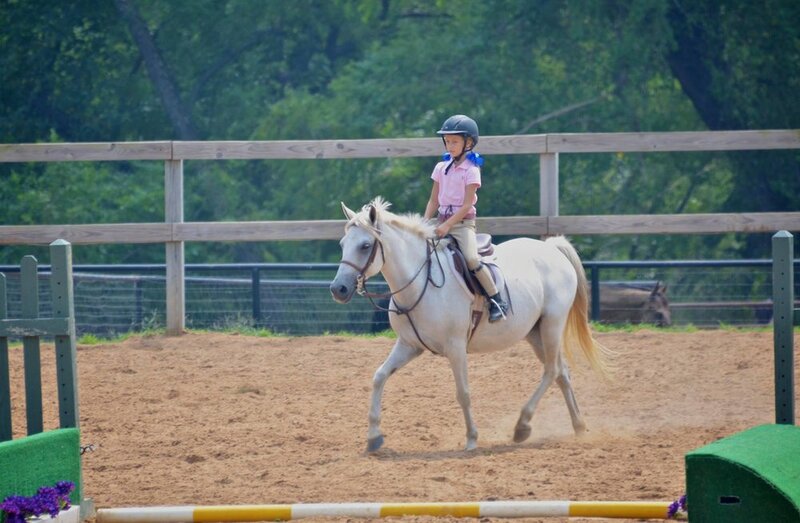 Fall session for our very beginner riders starts the week of August 26th! This is a 13 week session offered to beginner students newer to riding. Benefits include weekly 1-hour lessons at discount rates from $27/lesson! Sign up soon while spots are still available. Go to "Fall Session SignUp" link below for more info, dates/times, and to sign up and pay online. How easy is that?! Fall Lesson Schedule: Sign-ups Posted!! It's hard to believe that back-to-school and Fall Lesson schedules are right around the corner! Back to school brings us new lesson schedules for trainers and riders alike. Please check with your trainer's schedule of availability for the fall, and which days are most convenient for you/your child to lesson, when is the earliest & latest you can lesson, and if you prefer privates or groups. The trainers will contact you to finalize the day and lesson time for the fall schedule. Please Note: The trainers will do their best to accommodate your schedule; however, with 200+ students we cannot guarantee everyone's preferred day & time but will do our best. Sign-up sheets for August and September shows are on tack room window. Please sign up ASAP to reserve your spot and your favorite horse if on a school horse. We expecting quite a few riders at our shows this Fall & are looking forward to a great show season. Please contact SaddleBack or your trainers with any questions regarding horse shows. Tack & Apparel For any riding attire, tack, etc we recommend: EquiVenture in Jenks, The Horse of Course in Claremore, or www.SmartPakEquine.com online--they have free shipping & returns for sized items. Happy Valentine's Day from SaddleBack Equestrian! Our horses would love to be your valentine this year! Come out and show some love to your favorite horse at SaddleBack Equestrian this week and get $5 off your next lesson! Snap a picture of how you love your favorite horse--whether a school horse, your own horse, or just one you love. Then post it on SaddleBack Equestrian's Facebook page, OR post to Instagram with the hashtag #SaddleBackEquestrian and receive $5 off your next lesson! Offer good 2/10/18 - 2/17/18. The $5 off may be redeemed within the next thirty days. Be sure to let SaddleBack know you posted so we can discount your lesson. Crops are used often in horseback riding. They act as an extension of your arm or leg in order to reinforce your commands. If you’re riding a lazy horse, you may want a crop to help get them moving. Hold the crop in your dominant hand (unless your horse likes to cut corners and veer away from the fence; then you may want to hold it in your inside hand) and gently tap the horse behind your leg. You should only tap a horse with a crop if they have ignored your previous commands. Crops are only used as a last resort if your horse isn’t listening to you, and should never be used to punish or intentionally hurt the horse. If you are whacking your horse and leaving marks on them, you are hitting them too hard. Horses may also associate the overuse of a crop with something they are frightened of. For example, if your horse is afraid to cross a stream, and you are continuously whipping them with a crop, it will probably only make them even more afraid of the stream, and next time, they will be even more reluctant. Crops are a great tool to help make your horse obey you, but should only be used as a reinforcement, not a punishment. SaddleBack Equestrian would like to wish each and every one of you a very Merry Christmas! We are thankful for the time you have spent with us this year. May the peace and joy of Christmas be with you today and throughout the new year! SaddleBack Christmas Party: Thank you to all who came out for the SBE Christmas Party on December 17. We had a lot of fun with games, ugly sweaters, yummy food & drinks, and time together! A special thank you to Mariana--owner of Wild Meadows--for hosting our group. She added a special touch to all the food & drinks! Christmas Specials: Need last minute gift ideas? You still have a few days left to purchase one of our 2017 Christmas Specials. These include discount lesson packages and gift certificates. You can order directly online from the link below. How easy is that?! Questionnaires are available via printed copies located in the tack room or text us if you would like one emailed to you. Please complete the survey ASAP--print off & bring to next lesson, fill out during your child's lesson, or take copy home & bring back, dropping into red Payment box in tack room once completed.